Second Big Week of Mid Season Sale on Now! Harris Scarfe is an Australian-based department store that was established in Adelaide, South Australia in 1849. 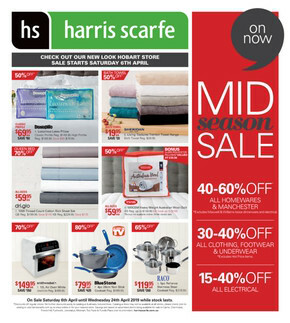 Shop at Harris Scarfe online to browse weekly ads and catalogues with all the latest deals and special offers on homewares, Manchester, and apparel. 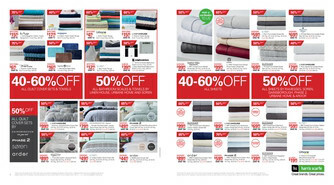 Shop at Harris Scarfe online for great savings! Check out the Sale section to browse fantastic products at reduced prices. Browse by product, brand, price, size or colour to make selecting your next purchase quick and easy! 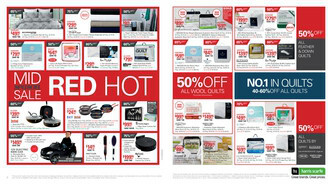 With a Harris Scarfe Value Plus Card, you’re entitled to a free $25 gift card, free extended warranty on electricals, exclusive offers and up to 60 days interest free. Upgrade to a Value Plus Gold Card for only $60 and you’ll also receive a 5-10% discount off most in store and catalogue stock, including sale items! 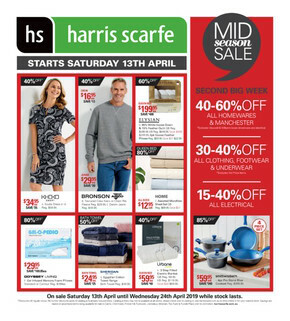 Visit the Shopfully site or app for information on store locations, opening times, and to browse the latest Harris Scarfe flyer for amazing deals.